piketastic wrote: blank for me yesterday. there's a big un due, I can feel it !!!!! Out today for a dad and lad Pike session with my son. 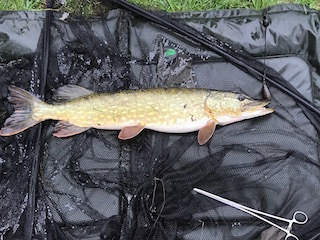 Stuart has had a run of blanks Pike fishing on our increasingly rare trips together, so he was keen to try the runs water after my sessions on there recently, just to put a bend in his rod for a change. We got there on first light and had already decided to share a peg and fish with just three rods, taking it in turns with any runs (Stuart always gets first run, even at 19 years old) The wind was pushing hard into the left hand corner, so we opted for a peg that affords a little bit more shelter but still gives access to the deeper area of the Mere. 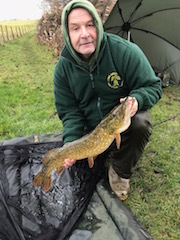 It turned out to be one of the quieter days on the water with 5 fish from 8 runs, Stuart getting 3 fish between 5-8Lbs and I managed 2 both around the 6Lbs mark. 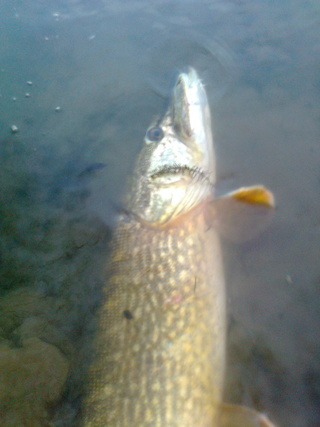 Again the fish were heavily leached up and all the fish were only lightly hooked on one treble. 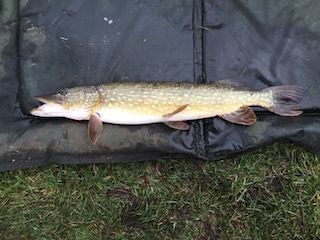 David Wynne wrote: Out today for a dad and lad Pike session with my son. 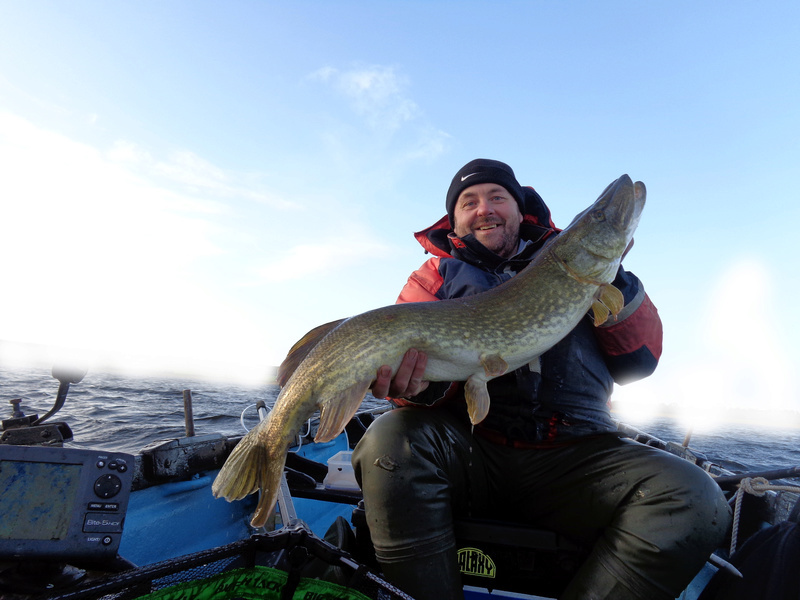 Stuart has had a run of blanks Pike fishing on our increasingly rare trips together, so he was keen to try the runs water after my sessions on there recently, just to put a bend in his rod for a change. a trip to Scotland in March should be a bit warmer then. I made the long journey down to South Staffordshire to fish one of my clubs waters on Thursday. It's a relatively lightly fished 20+acre shallow water that was formed as a result of subsidence from the nearby mines. 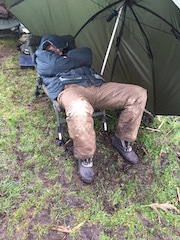 I've been hearing consistent reports about its potential and it has a history of producing big Bream, Tench and Carp along with some decent Pike. I arrived at first light and knew as soon as I looked at the colour of the water it would be a difficult day, as it resembled a cup of tea after all the rain of the last few weeks, apparently is normally gin clear. 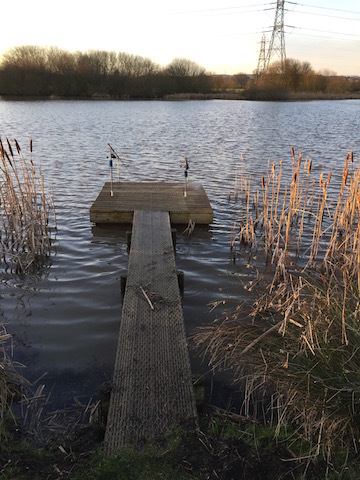 I had a bit of a mooch round and settled on the 3rd peg round, as it looked pretty good and with the gusty wind pushing down this end, it gave me plenty of water to go at. Oily and bloody baits would be the order of the day so as to leave a nice scent and blood trail for any Pike to pick up on. The session itself was hard going, I tried all my normal tactics and had all but resigned myself to a blank when I noticed that a Grebe had started to work this end of the lake. 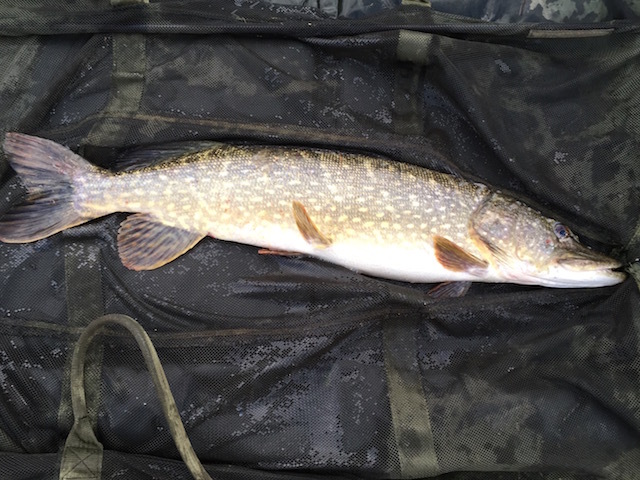 Shortly after the right hand rod with a Lamprey head was away, and a nice fat looking Pike of 10Lbs 2oz was in the net and the dreaded blank had been avoided. 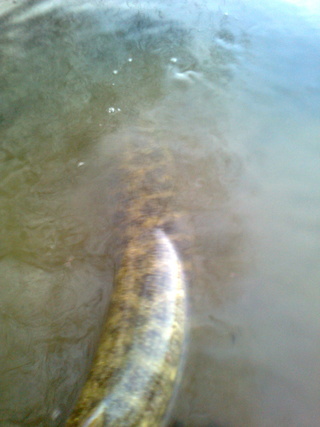 David Wynne wrote: I made the long journey down to South Staffordshire to fish one of my clubs waters on Thursday. It's a relatively lightly fished 20+acre shallow water that was formed as a result of subsidence from the nearby mines. I've been hearing consistent reports about its potential and it has a history of producing big Bream, Tench and Carp along with some decent Pike. Sorry I didn't see you Stubbo I think I was the only one on the water. psion wrote: Sorry I didn't see you Stubbo I think I was the only one on the water.